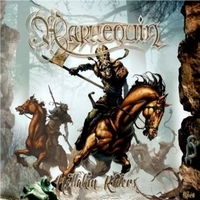 With Harllequin another band from Brazil is trying to get the attention of metal fans. Hellakin Riders kicks off with Three Days In Hell, at the opener the Paulistanos combine thrashy riffs, an up-tempo drum beat with US metal-like vocals and a dash of symphonic power metal. But guitarist Fabricio Moraes and keyboarder Pedro Val add a different flavor later in the song. Archangel Asylum starts slowly and the atmospheric opening passage reminds me a bit of Iced Earth.... With fast drumming and staccato riffing they storm off, then breaks add a progressive edge. Little later the vocals and progressive elements make me think of old Lions Share... While other passages are more Helstar-like... Lyrically the conceptual album is based on the Spanish legend of Bando do Arlequin, a group of knights who were put under a spell and damned to live between life and death for all time. With King Of The Dead they slow down a bit - at least for awhile. The song shows their prog metal influences and singer Mario Linhares reduces the screams, but in a way this one represents the album very well, coz it shows all the ingredients of the Harllequin sound. It seems that one of Mario Linhares' influences was / is Michael Kiske... And the early Geoff Tate another. You see, the influences / elements are varying, but so far the guys haven't develop a trademark sound. Later in the album they add new sounds to their mix, so does The Bride offer some 70's rock-influences. Actually I think that the mid-paced tunes which have proggy edge are stronger then the fast, thrashy ones. At Daredevil you even get growls and female vocals, but I have the inkling that their sound universe is to vast for some metalheads... It's time for them to find their own sound! To focus on something. The closer is a piano-based power ballad called Ancestors.